Our family believes that a great day starts with a great breakfast - and we love opening our table to our guests. Start each morning off right with a panoramic view of wine country, and a sweet and savory three course breakfast: coffee/tea, french orange juice (when in season), fresh baked goods (usually fruit scones, biscuits, or coffee cake), fresh fruit, and a hand-crafted baked entree. We offer one breakfast selection daily, plus a daily scramble. savory corn waffle topped with maple sausage, sautéed shallots and spinach plus a poached egg. Fresh eggs baked to perfection with cream, fresh herbs and parmesan cheese. Served with herbed toast. Homemade pizza crust topped with crème fraîche, herbs, caramelized onion, bacon, cheese, and goat cheese scrambled eggs. In the summer we often offer a second version with peaches and arugula. Homemade pizza crust topped with a white sauce, herbs, cheese, sun dried tomatoes, baked eggs, and spinach or arugula. In the summer we often offer a second version with peaches and arugula. Homemade pie crust filled with eggs, cream sautéed shallots, mushrooms, bacon, spinach, fresh herbs and gruyère cheese. With advanced notice our quiche selections can be customized. Prepared in a cast iron skillet and topped with roasted tomatoes or arugula. Omelets are prepared individually and can be customized from available ingredients: sausage/bacon, spinach/arugula, shallots/caramelized onions, sautéed peppers, potatoes, cheese etc. Potatoes, onions, peppers, and chorizo baked with eggs and topped with roasted jalapeño pesto sauce. Can be a little spicy! Savory baked polenta (with cheese) topped with roasted portobello mushrooms, herbs, and a soft-boiled egg. Savory baked polenta (with cheese) topped with roasted asparagus spears, vinaigrette, and a soft-boiled egg. Southern cheesy grits, topped with caramelized onions, sautéed greens (spinach, arugula, or kale), sautéed cherry tomatoes, bacon crumbles, and a poached egg. Homemade tortillas (half corn, half flour), filled with daily available toppings: eggs, potatoes, bacon, cheese, chorizo, black beans, and avocados. Served with Chaly’s fresh salsa: tomatoes, jalapeños and serrano peppers, and cilantro. A stacked and baked version of breakfast tacos with daily available fillings: potatoes, bacon/chorizo, black beans, cheese, and topped with a fried egg, pico de gallo and avocados. Served with Chaly’s fresh salsa: tomatoes, jalapeños and serrano peppers, and cilantro. Rosemary roasted sweet potatoes, sautéed onions and sweet peppers, maple sausage, topped with a poached or fried egg. Pan fried potatoes and onions seasoned with paprika and chili oil, topped with a fried or poached egg and served with a spicy aioli. Two slices of toast topped with an avocado spread, fresh herbs, cherry tomatoes, and a soft boiled eggs. Our version uses a mix of fresh salad greens (the best available), smoky bacon, dijon vinaigrette with shallots, topped with soft poached eggs, and side of herbed toast. Can’t decide? 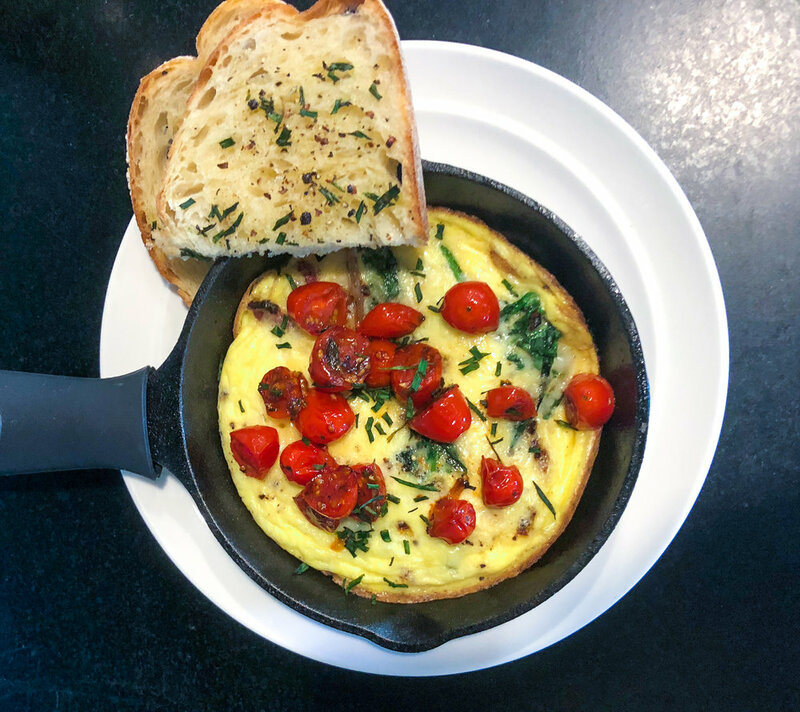 Most days we are able to offer a second option of eggs scrambled with a selection of available ingredients, served with herbed toast. With advanced notice most entrees can be tailored to specific dietary needs: gluten free, dairy free, vegetarian, egg-free, etc. Please let us know in advance of any dietary preferences.